There’s a lot of rhubarb grown on farms in the country. Just about everyone has a patch somewhere out in the yard and everyone looks forward to the beautiful green and red shoots that can be baked up into the most delicious pies, tarts, jams, cakes, squares and even punch. Yes, punch. My sister-in-law has been making a rhubarb punch for as long as I’ve known her, It comes from straining cooked rhubarb and serving it mixed with sugar and ginger ale. It’s positively delicious; a little tart, a little sweet and I always look forward to having some when we visit. 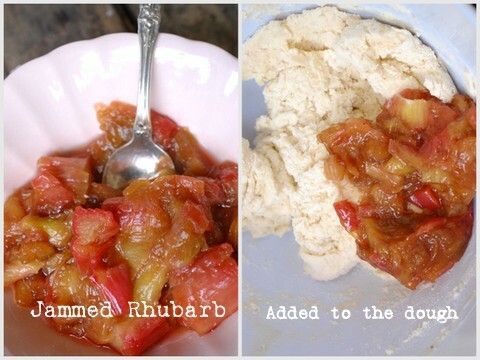 This recipe though, isn’t for rhubarb punch, it’s for Rhubarb Sponge Pudding which is a delightful way to make use of some of that rhubarb that may be growing in your garden. Unfortunately my rhubarb never survives the winters and I’ve all but given up hope of ever having my own patch. Thankfully the neighbours are generous and share plenty of their’s with me. This is some that I’ve had in the freezer from last year’s season so I wanted to get it used up. This recipe sounded like the perfect way to use it and one I’m sure I’ll use again and again. The moist sponge topping is light, yet full of flavour and it really compliments the tender fruit underneath. I sweetened mine with pure maple syrup, popped a few raspberries into each ramekin and it was a delightful combination of some of my favourite flavours. Perfect with vanilla ice cream. (Unfortunately those pictures have seemingly disappeared). This can be made as a single desert in a 9×9-inch baking pan or in 6 individual ramekins. Either is perfect for sharing and can be made well ahead of any entertaining you may be doing as it keeps well for days in the refrigerator. 2. 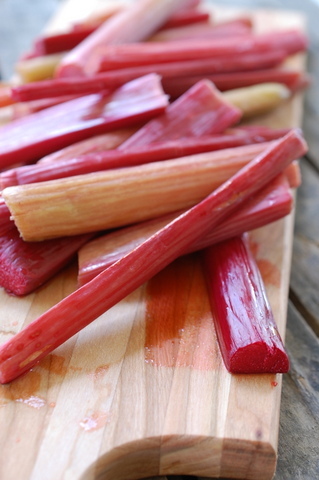 Place rhubarb in lightly buttered 9×9-inch pan or 6 ramekins. Drizzle with the syrup and brown sugar. 3. Beat butter and sugar together in a bowl until light and fluffy. Beat in eggs. 4. Mix together dry ingredients and gently fold into the batter. Spread on top of the rhubarb. 5. Bake for 30 to 35 minutes or until a toothpick comes out clean. Serve while still warm with custard or ice cream. Optional: Add in 1 cup of your favourite berries (strawberries or raspberries work best) to the 9×9-inch pan or 3-4 berries per ramekin. 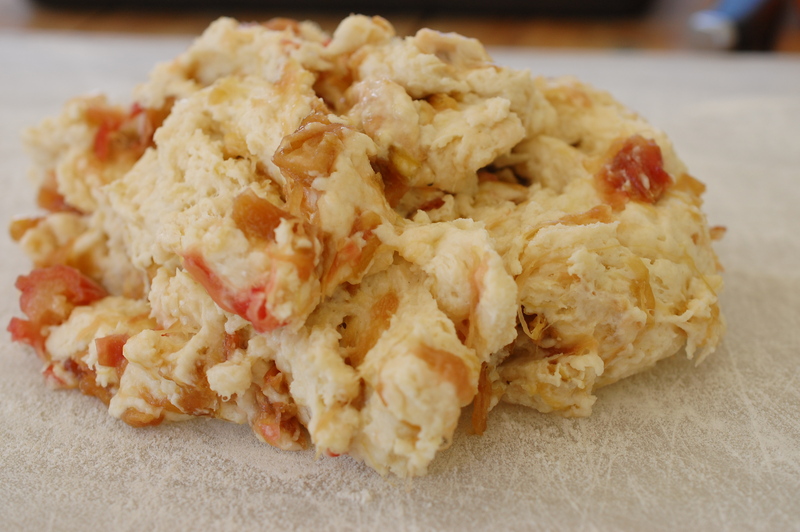 Last we spoke, I told you I was making Rhubarb Honey Yogurt Scones and I told you I’d let you know how they turned out. I wasn’t really trying to keep all of this goodness to myself. Really, I wasn’t. I just happened to get busy baking cakes for a few friends and neighbours celebrating birthdays and anniversaries and such. Oh, and maybe a wedding. Or two. So I haven’t been able to share these with you until now. But truth be told, they’re worth every minute you’ve waited. 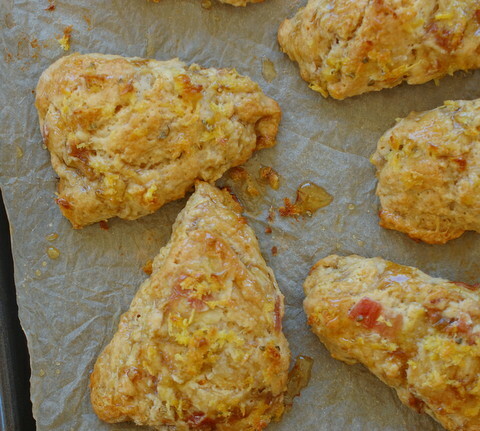 These scones are magically light and fluffy with a zesty sweetness of jammed rhubarb and candied lemons balanced out with a little drizzled honey and a sprinkle of rosemary. They bake up tender and biscuit-like, but have the texture of a typical scone and I just love how rustic they look, once baked. They’re best served slightly warm and taste just as good without butter or preserves as they do with them. 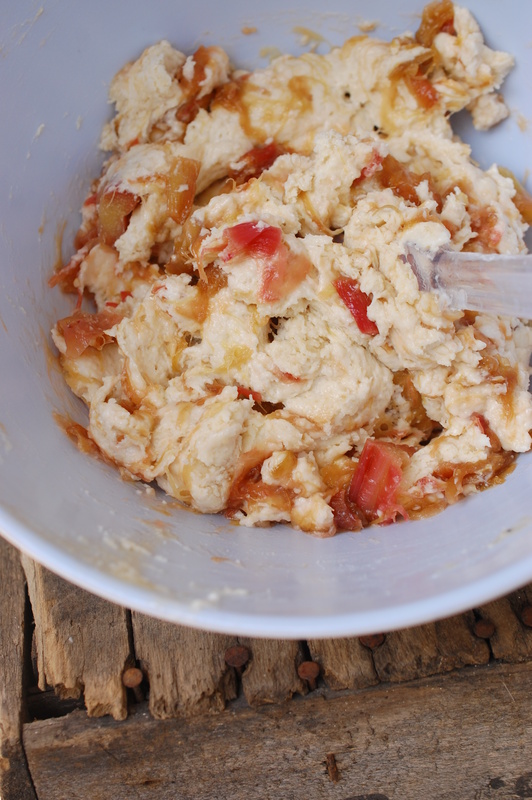 This is the yogurt and honey dough with the jammed rhubarb folded in. The dough is gathered into a ball on a floured surface, cut into 8 wedges and sprinkled with candied lemon zest and chopped rosemary. I adapted these scones from a recipe by Joy the Baker for Grapefruit Honey Yogurt Scones, which you can find here. I used Joy’s idea for grapefruit and switched it out with the rhubarb, lemon, and rosemary,which may sound strange, but it really, really, works so you’re just going to have to trust me on this one. Besides, my middle name is Joy, so you never know, we just may be kindred spirits when it comes to scone flavour combinations. 1. Preheat oven to 400 degrees F. Line a baking sheet with parchment paper and set aside. 2. 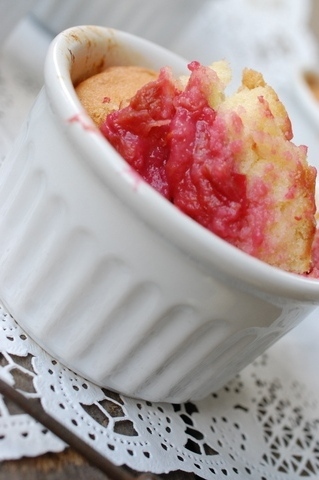 In a medium pot, simmer rhubarb with brown sugar until it thickens into a jam. Set aside. 3. Zest the lemon and rub together with the tablespoon of sugar and set aside. 4. Dice cold butter into small chunks and add to the dry ingredients. Using a pastry mixer or your fingers and working quickly, break the butter down into the flour mixture until the butter chunks are the size of small peas. Add the honey, plain yogurt. Toss together lightly with a fork until all of the dry ingredients are moistened by the yogurt and honey. 5. Next add the jammed rhubarb and fold gently. 6. Turn the scone dough out onto a lightly floured surface. Form into an 8 inch circle, about 1 inch thick. 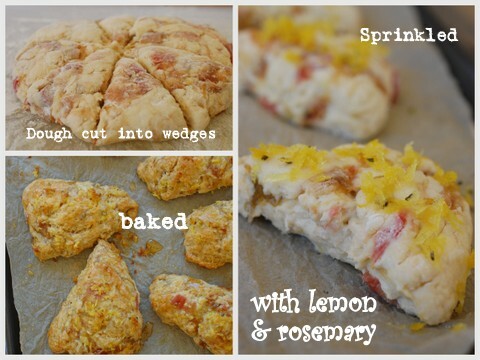 Use a knife or a bench scraper to cut the dough into eight scone triangles. Place the triangles on the prepared baking sheet. Generously sprinkle the tops of the scones with the candied lemon zest and chopped rosemary. 7. Bake for 15 minutes, until slightly gold brown on top and firm but soft in the center. Drizzle each scone with honey and allow to cool on the pan for 10 minutes before serving. Serve warm with butter or jam. These scones are best served the day they’re made.